After my "life-drawing" session yesterday, I focused today on symbolic images. There is a tree near my mom's house that's a destination point for my morning jogs. It feels great to lean against a strong tree with no one around. Next to the tree are golden pastures with cows, bulls and calves. In this painting, the cow, bull and calf represent the mother, father and child. One can also think of them as the Holy Trinity. 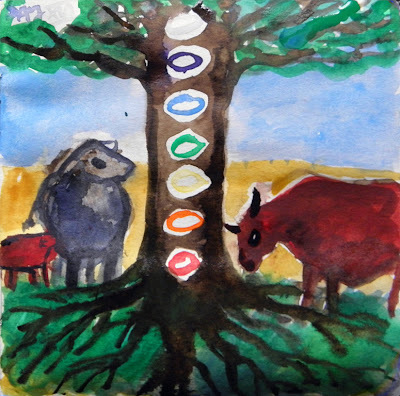 I put the seven colors of the chakras, or energy centers, on the tree because I have been doing some tree-based meditations to ground myself and feel connected to the earth. This may sound weird but my grandmother, Katherine Kilgore, used to lead me in similar meditations when I was a little girl! In one meditation, you imagine the energy flow from the branches and the roots meeting and centering in each one of your chakras, clearing out any unneeded debris. Or, you can simply hug a tree and imagine yourself breathing through or with the tree. I heard that hugging a tree from the back is wonderful, so I tried it! I'm loving this watercolor! You did a wonderful job!